It's time for us to promote the sales of other photographer's work who we admire. Lets buy one another's work! 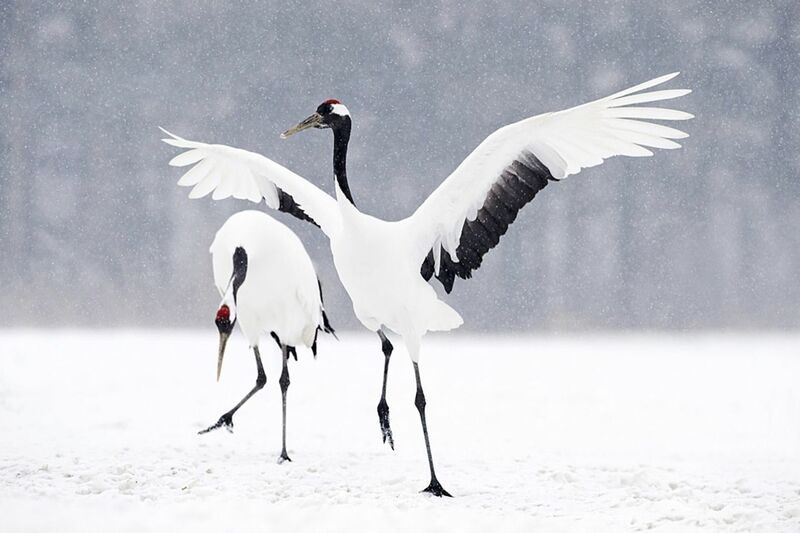 I remember seeing a beautiful image of Japanese red crowned cranes photographed by a very talented wildlife photographer called David Tipling. I could not resist it and bought it from him and this is not the first photograph I have bought from another photographer, so come everybody, let's start a movement to promote landscape and all types of photography that we know and hold so dear by buying this wonderful art form from one another. I cannot summarise my feelings better than Lis Long who wrote the following on collecting photography. “The best reason to buy a photograph is that you like it: it gives you pleasure, stimulates you, challenges you. Everything else, especially the issue of investment, always comes second. Photography only started being recognised as an art worth the serious attention of collectors in the 1970s. Because it is such a relative newcomer, there are fewer established guides - and the vocabulary is still being defined and refined. A ‘vintage’ print, for example, is one made shortly after - normally within three years of - the making of the negative, although the word is often used with much less precision. However, the most important term to remember is ‘original’. An original photograph is hand-made, and authenticated by the photographer during his or her lifetime. In most cases it is signed by the photographer and, increasingly, produced in a limited edition. Prices, even for the work of the acknowledged leaders in the field, are still very reasonable. They have however moved quite fast: for example, Ansel Adams in 1948 charged $50 for a print of his most famous photograph - Moonrise, Hernandez, New Mexico; now it would be difficult to find one for less than $25,000. Nowadays - especially in the UK, where understanding and appreciation of photography as an art form is still way behind the USA, excellent images by less established photographers can be acquired for under £100, and works by the acknowledged masters can still be found under £1000. People collect photographs for all sorts of reasons and in all sorts of ways. Some collect by category (portraits, still-life, landscape) or by specific subject (portraits of playwrights, landscapes of a particular region). Others structure their collections by style, by period or by technique (for example ambrotypes or daguerreotypes). Perhaps most rewarding of all is the opportunity to focus a collection by specialising in the work of one or two particular photographers. Most of these kinds of collection can often be substantially increased in value - as well as in interest for the collector - by collecting supporting documentation: catalogues, exhibition reviews, interviews and so on. There are four current major sources of photographs for UK buyers: auctions (‘real’ or virtual), exhibitions, dealers, and the photographers themselves. Photography auctions are much more common in the USA than the UK - but Christie’s now run biannual photography sales in London and other auctions are increasing in frequency. of acquiring something special at a low price. However, auctions, while they can be an enjoyable way of getting a bargain, can be an uncomfortable way of gaining experience. Buying at exhibition is an important channel: there is the chance to view a substantial part of the oeuvre of a particular photographer and it is an excellent way of keeping up to date with new work. At any one time in the UK there will be fifteen or so exhibitions of first-class photography - fewer than in the USA, but increasing in number and importance all the time. Buying from dealers - whether specialist photography galleries or more generalist dealers in fine art - is another common way of building a collection, with the advantage that a professional dealer can guide and educate the collector. Buying from photographers themselves, even the most distinguished of them, is still a possibility in the UK, although, as the market develops, this will become less and less easy. For those who choose to specialise in the work of one or more photographers, buying direct is very rewarding, as it gives the collector the opportunity to take an active interest in the career of the photographer, to follow his or her development, and indeed to participate in that development by regular purchase and/or by commissioning work. Whether colour or monochrome, an excellent photograph will have been meticulously printed by the photographer on specialist paper, in order to combine the highest possible aesthetic standards with archival stability - usually for 200+ years. Photographs are vulnerable to both light and moisture and so should be handled with extreme care. It is recommended that ultra-violet absorbing glass is used when framing and that photographs are not exposed to direct sunlight, unfiltered fluorescent lamps or the heat of incandescent bulbs. Ideal environmental conditions are between 68o and 72o F and between 44% and 55% humidity. Learn everything you can about the photographer. If not, check how many possible”.